Actions and activities going on across the country for social justice. Here is a weekly round-up of news not covered in the mainstream. From the March 22nd 2013 edition of AW@L Radio - This show starts with a call out to Melt the Freeze on minimum wage in ontario, with actions taking place at government offices across ontario thursday and friday to kick off a week of action. Over 30 MPPs will be visited to demand a rise in minimum wage to bring workers above the poverty line. We jump to the push in KW to have eBikes banned from bike paths and bike lanes after a motion passed in cambridge which will see 140$ tickets given to eBikers using cyclist and pedestrian infrastructure. Dan responds to this with his own letter to the editor* calling for unity in 2 wheeler world, and solidarity for human scale streetscapes. Next up is a report that waterloo regional cops will be getting pay raises for the next three years to bring their base pig pay to 90 000$+ by 2014. The pay raise reflects the increase in the police budget passed in waterloo region, while other items on the budget were frozen or slashed including housing programs and community transport. The only other item that increased other than the police budget was how much the average tax bill was. The Waterloo regional service budget has the costs fo police services at more than double that of any other budget item. We then go to a report from NOII vancouver on the recent raids of worksites in the west coast city where canadian border agents were accompanied by a reality film crew which had detained workers sign waivers while being held by armed men. in this week's "if you can't beat them, reform them" we direct folks to a change.org petition demanding the immediate cancellation of the show. CBSA stays our focus as minister of censorship and deportation jason kenny launches a new set of ads warning canadians of "marriage fraud" related to marrying immigrants. I think someone should put out a warning around marrying a conservative douche. Sticking with migrant justice, we find out that state target Dr. Hassan Diab has to pay 2000$/month for the GPS device that the government is making him wear, or he will have to return to jail. Dr. Diab's support committee have called for a Hundred for Hassan - check out more on his webpage. As the mennonite central committee's Dawn Penner hosted a report back on their ongoing humanitarian work in Syria, the CUPW union and one of their solidarity activists was targeted by conservative MPs during question period with an error filled diatribe. At issue was the contents of the union's recent newsletter (which was deemed radical) and where funds came from to pay for a trip to occupied Palestine, or what was described as "a giant open sky prison." We then go to Subverso with Terroristas. OCAP has been continuing their actions in toronto after several weeks of sustained actions at and in city buildings. On april 3rd, the anti-poverty group will be back in toronto city council demanding the city open up another homeless shelter now! before any more deaths. The national farmers union of ontario and the canadian biotechnology action network have called for an april 9th 2013 day of action to stop the release of GM alfalfa into eastern canada. cban.ca has more info and many resources for the DOA which calls for a range of actions to take place. And in another call out for action, rising tide Coast Salish called for a DOA against the pacific trail natural gas pipeline that chevron and apache corps seek to build in unceded BC. the pipeline would carry liquified natrual gas that is fracked from the ground. From Coast Salish to Ecuador, Nigeria to Banladesh, Support the Uni'sto'ten and say Frack Off! to chevron. Jumping back into direct action - the Red Lake nation in minnisota have created a blockade against enbridge who have pipelines running through their territories without easements. The actions are taking place in solidarity with Indigenous across turtle island and for mother earth. 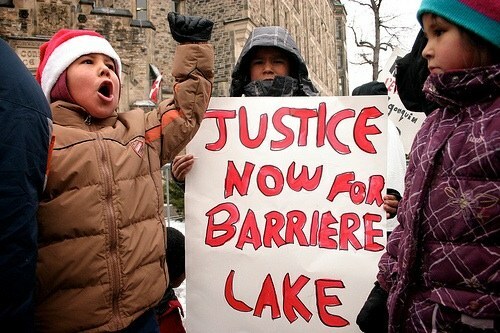 Mining watch reports that the Algonquins of Barriere Lake have reaffirmed their opposition to mining in their lands and have noted the Rivère Doré project from Copper One, runs counter to the 1991 trilateral agreement between the indigenous community, quebec, and canada that requires free prior and informed consent for all resource projects. Finally we go to a report from saskatchewan where indigenous and non-indigenous community members gathered in prince albert for an Idle No More teach-in on the proposed construction of a nuclear waste repository in the province. THe committee for future generations was on hand saying there is a responsibility to protect the water, while some questioned the legitimacy of a project that would require nuclear waste to be carried thousands of kilometres from across the country though multiple jurisdictions. Regardless, Pinehouse residents presented that an agreement their leadership made with a development company cameco areva, includes a silencing of dissent clause. Thats it for the Smash the State Report the week, we close off with Byron's song Clap yer hands, and a suggestion that folks listen to former AW@L radio co-host and G20 state target Sterling Stutz contributes to an update on Nashville's The Final Straw on the recent rash of repression against american activists in relation to the 2010 toronto g20 convergence. i travel much faster and more silently on pathways when i cycle then most ebikes i see. there is nothing wrong with travelling in such a swift manner as long as you communicate with others on the trail with you. use a bell, a horn, your voice, a card-clicker in your wheel... it does not really matter, but keep a smile on your face and keep the humanity in getting from one place to another safely. ebikes are an increasingly affordable means for people to get around and banning them from bikelanes and pathways will put them at greater risk of injury and death from cars (who as cyclists and bikers we are well aware, do not care much for the safety for 2 wheeled transport). in a time when we need to adopt less damaging modes of transport, looking to put more barriers to the adoption of ebikes is a ridiculous move. let's not play these divide and conquer games between 2wheelers (and trikes, and other non-car/trucks) and let's focus on getting more bike lanes (segregated from cars lanes) that we can all share and to car/truck speed on the city's two lane and residential roads to 40km/h or less. how about a focus on building a car free or at least (e)bike/pedestrian/humanScaleTransport friendly streetscape and society (we dont need 1 tonne vehicles to get to work or get groceries etc...), smile and wave while riding on the trails (and the roads) and communicate when overtaking other riders.